In the July 1993 issue of Truckin' magazine, we printed a story called "Power Piloting For Old Chevys" which focused upon a trick new power steering kit for 1947-'59 Chevy truck owners. The kit is manufactured and offered from Classic Performance Products and is designed to be used with any old GM truck, but especially the resto buffs. Well, Classic Performance Products have another power steering kit as well, but this kit is more for the serious customizer who is building a tricked-out ride. The kit uses a late model GM Saginaw power steering box and pitman arm, a late model steering column, and the new drag link, steering arm and other products provided in the kit. 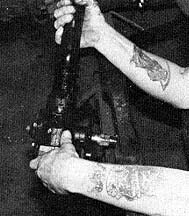 The process involves first removing our stock steering column and box assembly, then replacing the steering column with a late model unit (not included in the kit), preferably from a '70s or'80s Chevy van. 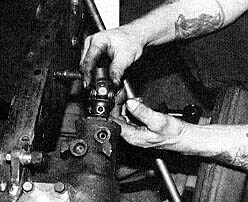 Then, the stock shock bracket riveted to the frame is removed and reinstalled aft of the axle on the frame, thus relocating the shock. 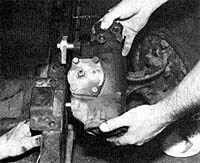 A GM Saginaw power steering gear box (not included in the kit) is attached to the frame using the dimensions provided in the instructions. The kit comes with three spacers that position the steering box appropriately away from the frame and a bracket that is to be welded onto the frame. Also, you will need to acquire a pitman arm that is 6-3/4 inches long. An El Camino or Chevelle has an arm that works well. The Classic Performance Products kit also includes a replacement steering arm that is mounted to the brake backing plate, with an adiustable drag link being attached at the pitman arm on one side, and to the steering arm at the other end. 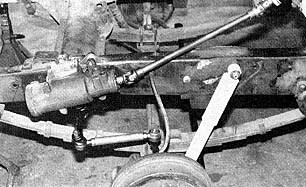 The last focal point is the steering shaft which must be constructed using Borgeson joints and 3/4-inch mild carbon steel intermediate shaft. 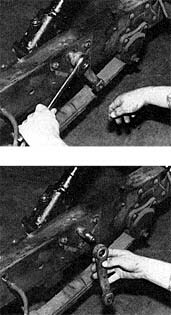 Attach the Borgeson joints to both the steering column and to the steering box, then measure the distance, cut and weld the joints onto the shaft, making sure that the joints are in time. 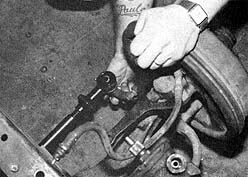 This power steering installation isn't very hard to accomplish and is more of a custom approach to installing power steering versus the first power steering story we showed in the July issue. Both kits work great, and now you have the option of choosing either or to get the job done as you like. 1. On all years drill 3/8" hole 12-1/2" from center line of axle towards front of vehicle and down 1" from top of framerail. 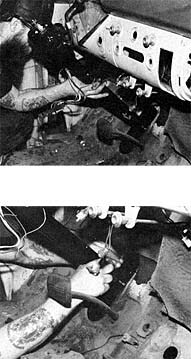 Note: (1947-54 do not use brake line hole as reference. 2. Lower shock brackets are flipped front to back, not left to right. The lower shock bracket will be angled upward allowing clearance for the tie-rod. The kit comes with an adjustable drag link, steering arm, steering box mounting bracket and spacers, and grease cups for the tie-rod ends. 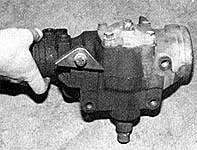 You must provide the power steering Saginaw box, new steering column (1970-1980 Chevy Van preferably), and the steering shaft. 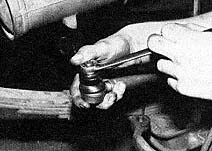 The first step is to remove the stock pitman arm from the original steering assembly. The factory steering column and gear box can now be removed. The best replacement steering column is a tilt Chevy Van model. This one has been made to fit right into the truck by welding on the dash mounting bracket and floor plate that holds the steering column in place. Simply install the new column in place of the old one once the mounting brackets have been installed. 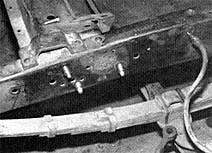 The floor plate holds the steering column firmly but you will have to adjust the bolts a few times when constructing the steering shaft. Here is what the new column looks like extending from the firewall with a Borgeson joint attached. Now we move down to the chassis which has already been jacked-up and properly supported, with the wheels, stock drag link and brake drums removed. Remove the shock from the top mount and remove the lower shock mount entirely. The driver's side lower bracket will be mounted on the passenger side and vice-versa, from the back side. The shock mount on the frame must be removed. The mount is riveted into place, so a chisel and hammer are the only way to break the mount loose. 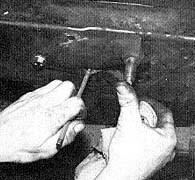 In the instructions, the exact location of the shock bracket is shown, but in this photo, you can see how one hole on the frame is utilized, while two others must be located and drilled. The shock mounting pin should sit right over the hole where the old pitman arm was mounted. When the other two holes are drilled, the shock bracket is firmly mounted. Now, the rivets that you chiseled off will obviously still be in the frame. Use a hammer and center punch to totally remove the rivets and clear the holes. From that mark you just made at 12-1/2 inches, measure down one inch and mark. This is where you will drill an additional 3/8 inch steering box mounting hole. 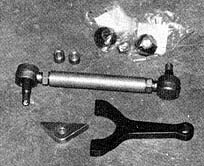 The kit provides a triangular bracket that attaches to the Saginaw steering box. This bracket holds the box in place on the frame which will be welded. Using the hole you just drilled and the frame bracket attached to the steering box, mark the two lower holes. Here you can see the two holes to be drilled. Once the holes have all been drilled, the provided bolts and spacers are inserted from the inside of the frame outward with the spacers on the outside of the frame. 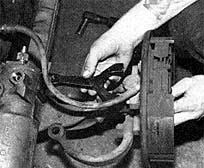 Have someone hold the power steering box in place while you tighten the bolts, securing the box to the frame. 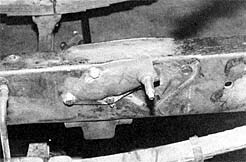 When the steering box has been bolted in place securely, weld the triangular bracket to the frame. 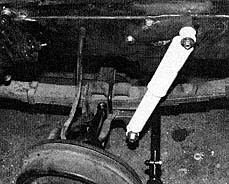 Next comes the installation of the new steering arm that is bolted to the axle and backing plate via the two upper assembly bolts. 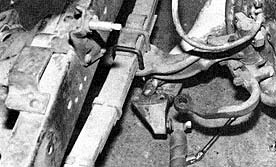 The factory steering arm that you see curving inward can either be cut down or left alone. 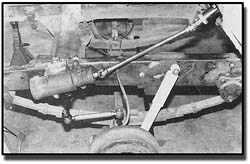 Now reconnect the tie-rod ends to the axle on both sides of the truck. 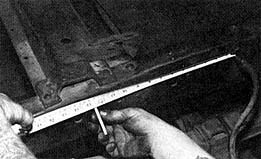 As long as you didn't mess with the revolutions of the tie-rod ends, the alignment will be fine. 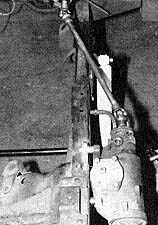 To install the shocks, the lower mounting bracket from the opposite side is used so that the shock can now be mounted behind the axle instead of in front. 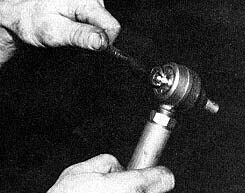 This is how the shock will look when installed properly. 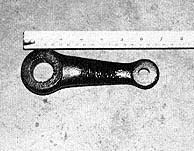 While you are out in the junkyard, you must get yourself a GM Pitman arm that measures 6-3/4 inches long. 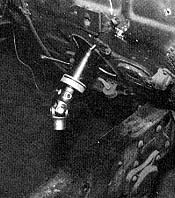 A Chevelle or El Camino version will work and in some cases, you may have to drill out the drag link end to accept the thickness of rod end on the drag link. Install the provided Zerk fittings into the rod ends of the drag link. The drag link is installed from the bottom side of the Pitman arm and secured in place with a cotter pin. The same goes for the other end of the drag link that connects from the underside of the new steering arm. 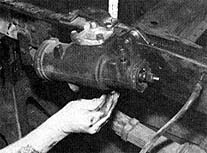 Now, install a Borgeson joint onto the output shaft of the steering box. 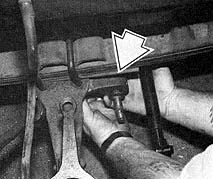 Insert the bar stock end into the upper Borgeson joint on the steering column and mark the desired length in relation to where the end of the intermediate shaft should be when installed into the joint. Shaft should be made from mild carbon steel. 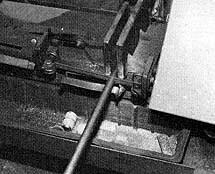 Either a bandsaw or a hacksaw will work to cut the Intermediate shaft. 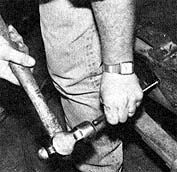 With both ends of the intermediate shaft installed properly into the Borgeson joints, time the joints. 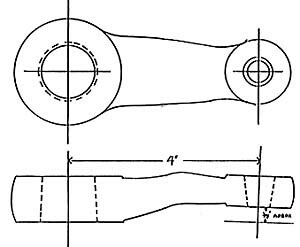 Joints on an intermediate shaft should be aligned so the ears of the yokes on that shaft are in line, not 90-degrees out of phase. It should be the same as a driveshaft. 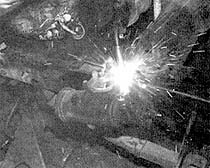 Then weld the intermediate shaft and the joints together. This is what the steering box will look like installed with the steering shaft attached. When you are done, this is what the assembly should look like. The only thing to do is to install the power steering pump and lines when you install the engine. Note: the Borgeson Joints are not in phase in this photo. But they were put into phase before they were welded. 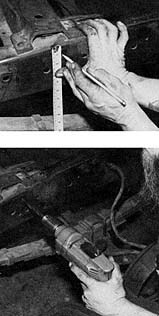 Locating the correct size pitman arm can be very difficult. 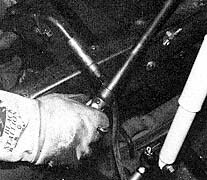 You can take any pitman arm that fits the steering box and which has the correct hole size for the drag link, and have it shortened. We recommend that you have it shortened and re-welded by a certified welding shop! Or for your convenience, a a shortened and re-welded pitman is also available from us.